Circular Site is een educatieve website met als doelstelling het uitdragen van informatie over het graancirkelfenomeen. Om het graancirkelfenomeen onder de aandacht te brengen van 'het grote publiek', organiseert Circular Site lezingen, workshops, exposities en reizen naar de graancirkels in Zuid-Engeland. Circular Site en Third Circle (de webwinkel) zijn opgericht door Janet Ossebaard: graancirkelonderzoeker, -fotograaf en -auteur sinds 1994. So far, this July has been a very busy month for the Circle Makers. They’ve kept us busy and interested with some of the most complex and beautiful swirls and spirals in recent memory. Germany has been very active this month, with 7 formations so far seen in the country. All are quite complex, and several are truly one of a kind, and rare in their form. 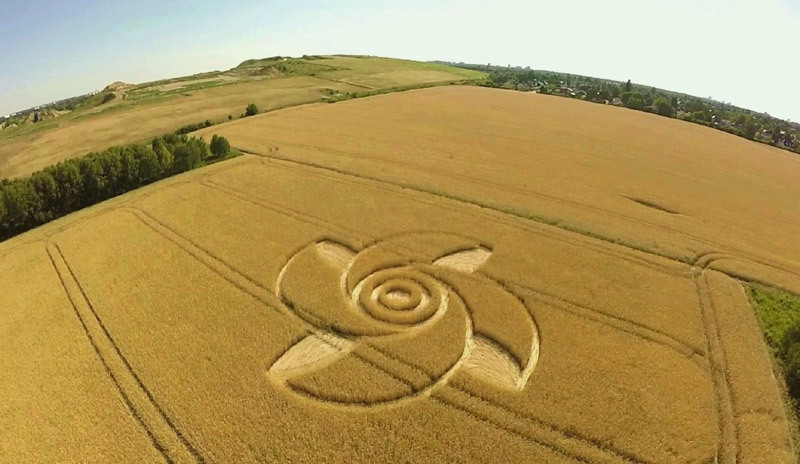 A formation that appeared in Wiltshire in particular is so unique and has large unconnected areas. The paths to those areas remained perfectly in tact, indicating a clear “stamping” aerially. This formation seen in Gorziethen, near Berlin in Germany on July 7th was absolutely beautiful, with an almost conch shape to the external flares. 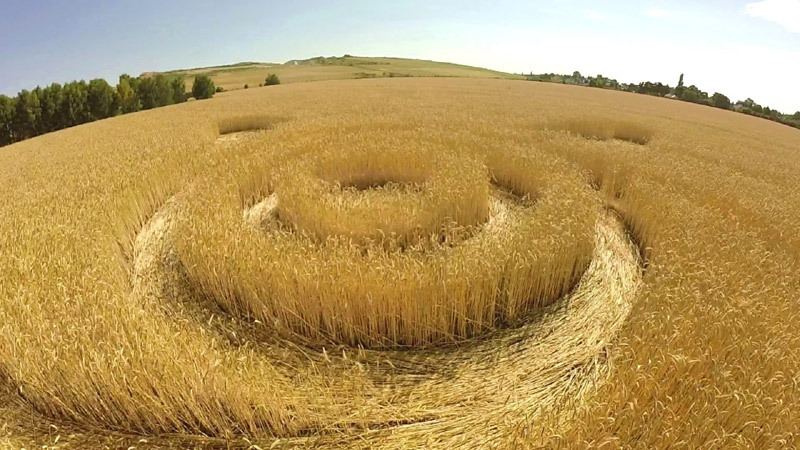 It was a highly unique formation with incredibly dense crush of the underlying wheat. The field appeared like it was “stamped” from above with high pressure seen in the middle of the formation, and breakage near the shapes edges. This formation was significantly different than any seen in the region before. What’s also interesting about this formation is the perfect center circles, and outer edges. The circles in the middle of this formation are precisely centered in the overall structure. In addition, the external edges of the flares are precisely equidistant from the center of the structure and also perfectly circular. It would be quite difficult for a person to have done this without an aerial view, making for a very interesting formation. The sharp corners were also very precise. This gorgeous formation, which was huge, and highly complex, was seen in Münchener Berg, Bavaria in Germany. It was found on July 16th, and was thought to be another overnight formation. Aerial views revealed an incredible symmetry to the structure, with all 8 corners being perfectly placed in the shape. There was no real pattern to underlying matted field, indicating it was unlikely to be caused by any person. The large size, fast appearance and incredible symmetry also helps this conclusion. This close up gives a better view of the harsh edges, perfectly straight lines, and perfect center placement of the formation in the circle cutout. A very unique formation for the region. 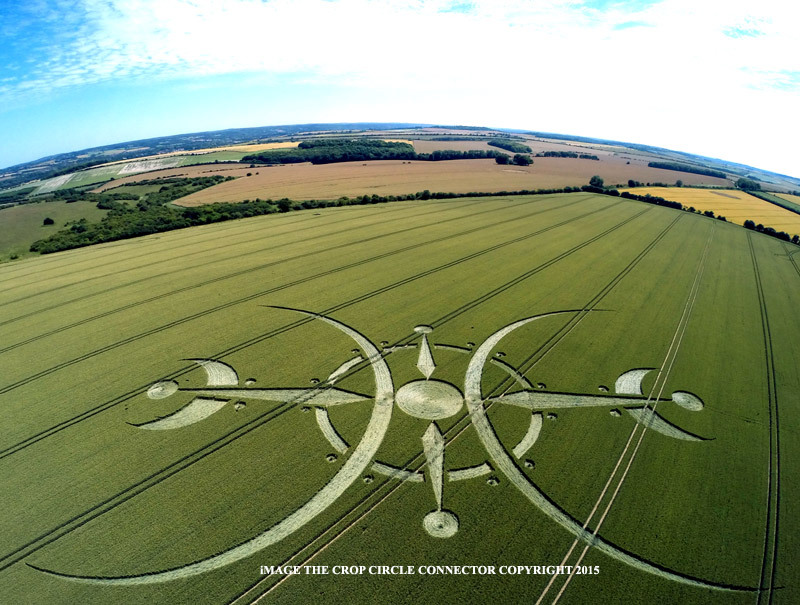 This extremely complex structure appeared also in a single night in Clearbury Ring, near Nunton, Wiltshire England. This was first reported on July 6th, 2015. This formation displays a completely unique structure, with massive concentric circles all perfectly formed with perfect edges. The large half moons flanking the center circle are precisely tapered, with no clear path for manufacturing between the various pieces. When zoomed in, it’s clear that the large sharper “horn” looking parts of the formation are not connected in any way to the other part of the structure. This gives it a precisely “stamped” appearance and is likely one of the best in recent memory examples of a true Circle Maker generated formation.